J.R. Smith (New Orleans Hornets) autographed 8x10 photo. All autographs are 100% guaranteed and come with a certificate of authenticity from www.RKSportsPromotions.com. Jeanie Buss (LA Lakers Owner & President) autographed 8x10 photo. All autographs are 100% guaranteed and this item comes with a certificate of authenticity from BAS (Beckett). 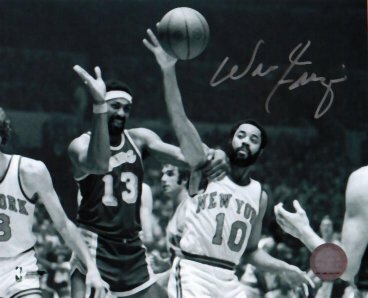 Earl 'The Pearl' Monroe (NY Knicks) autographed 8x10 photo. All autographs are 100% guaranteed and come with a certificate of authenticity from www.RKSportsPromotions.com. Otis Birdsong (NJ Nets) autographed 8x10 photo. All autographs are 100% guaranteed and come with a certificate of authenticity from www.rksportspromotions.com. Rick Barry (Warriors) autographed 8 x 10 photo. All autographs are 100% guaranteed and this piece come with a certificate of authenticy from Global. Greg Oden (Ohio State) autographed 8x10 photo. This piece of memorabilia comes with a certificate of authenticity as well as a matching serial numbered sticker on the photo itself from PSA/DNA.